Hopefully you can get your hands on this at Sephora, but if you have a lip product lover in your life, especially if they're into pinks and nudes, this is perfect! And probably worth more than what you pay for too. This set comes with 6 lip products: 2 full sized ones and 4 mini ones (which are pretty generous for sample sizes). The Sephora Collection Glossy Gloss in Precious Pink retails from $7.00 - $10.00 (far left). The Tarte Lip Surgence Natural Matte Lip Tint in Hope retails for $24.00 so that product itself is well worth getting this lip set. 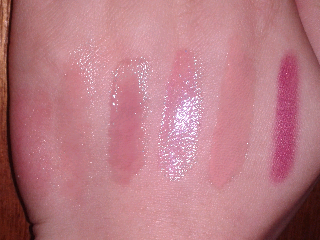 From left to right: FreshSugar Rose tinted lip treatment, Sephora Collection Glossy Gloss in Precious Pink, Bite Lip Shine in Vintage, Laura Mercier Lip Glace in Baby Doll, Hourglass Extreme Sheen High Shine Lip Gloss in Child, and Tarte LipSurgence Natural Matte Lip Tint in Hope. To be honest, I got this set for myself mostly because I wanted to try the Tarte Lip Surgence and was thinking about getting the Tarte LipSurgence set, but decided I wanted more variety. I hope you guys can find this in stores or online still (sorry it is late posting). It retails at $25.00 and is well worth the price.